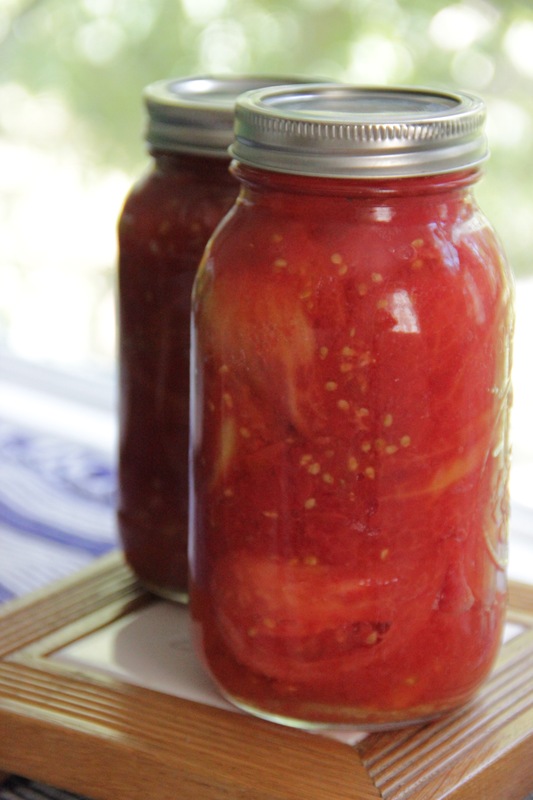 Have you ever wondered how to can tomatoes? There are many different ways to preserve foods. You can can foods in jars and make them shelf stable with a water bath but you can also oil-pack them, freeze fruits and veggies in large containers, or dry/dehydrate them, just to name a few examples. Water baths can be used for high acid foods (like tomatoes), such as fruits, jams and jellies or pickles. It’s a commonly used technique for home cooks and canners! Canning is an easy way to preserve foods throughout the year and with summer always being so abundant, it’s a sustainable way to still enjoy local fruits in the cold winter months. I also appreciate that my foods are being stored in reusable glass bottles rather than metal tins that will simply be thrown out or recycled. Over the years, I’ve done a lot of canning, When I’ve done it, I’ve found it usually happens in phases, typically based on the produce available and the fact that when I have enough to actually make it worthwhile to can, I can a lot. Two years ago when I was in Maryland, I canned up a bunch of produce ranging from jams, to pickles, chutneys, relishes and so on. Last year I still had so much left over that I didn’t do very much- just some Pear Ginger Preserves. This year however, I’ve started running low on supplies again! That, along with having access to lots of inexpensive local produce means that I’ve been doing a lot of off-and-on bulk canning (remember my round-up post on dealing with bulk strawberries?). This past weekend was one of those weekends. I bought a big 25lb box of tomatoes and spent several hours Sunday canning them up. I plan on doing the same thing next weekend, but canning them as salsas, BBQ sauce and my favorite curried tomato jam. While I’ve found (from personal experience) that there is such a thing as too much jam, there is never such a thing as too much canned tomatoes. 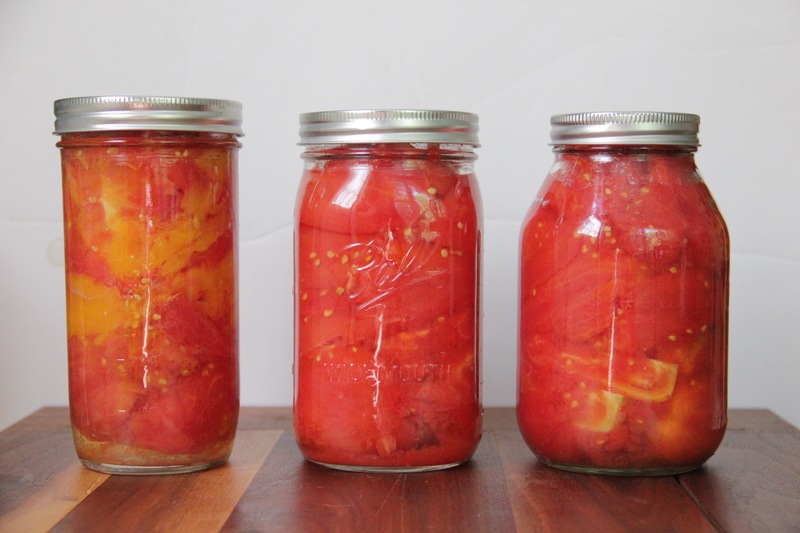 With that in mind, I wanted to share with you one of the simplest water bath canning recipes out there: canned tomatoes! 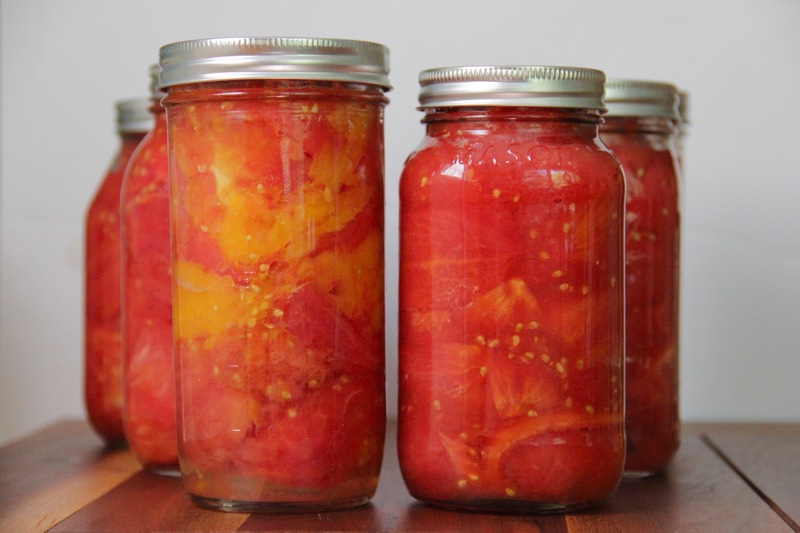 Canning tomatoes is great for people interested in starting out because unlike jams, it doesn’t require that you get it to just the right gelling consistency. It is simply a matter of peeling, chopping and stuffing them into jars. *In this case, it’s best to go with bottled lemon juice, as the acidity can vary from lemon to lemon. *You can get away without using a canning rack, however it makes it much easier to get the jars in and out of the water as well as prevents them from touching direct heat on the bottom of the pot, which could cause them to crack. If you choose to get one, make sure it’s stainless steel, as it can rust otherwise. *You can get away without these however it makes things a lot easier to have them and reduces your chance of getting burnt with boiling water- I never can without them! Now it may seem a little intimidating with all this equipment but once you have it it’s easy to go! Prepare Your Stations: If you are using it, put the canning rack in the large pot and fill 2/3 of the way with water (you want enough water that they jars will be covered when you add them). Put the bands and lids in the small pot and fill with water. Fill the medium pot halfway with water and add cold water and ice to the medium-sized bowl. Start off by bringing the large pot up to a steady simmer. This will take some time so start this 10 minutes before you begin boiling the medium-sized pot. As soon as the large pot starts to simmer, add the empty jars in batches and submerge them until you are ready to use. Similarly, bring the small pot with the lids and bands to a simmer for several minutes before turn off the heat. Leave the lids and bands in the water until you are ready to use. Once the medium-sized pot begins simmering it’s time to start preparing the tomatoes! 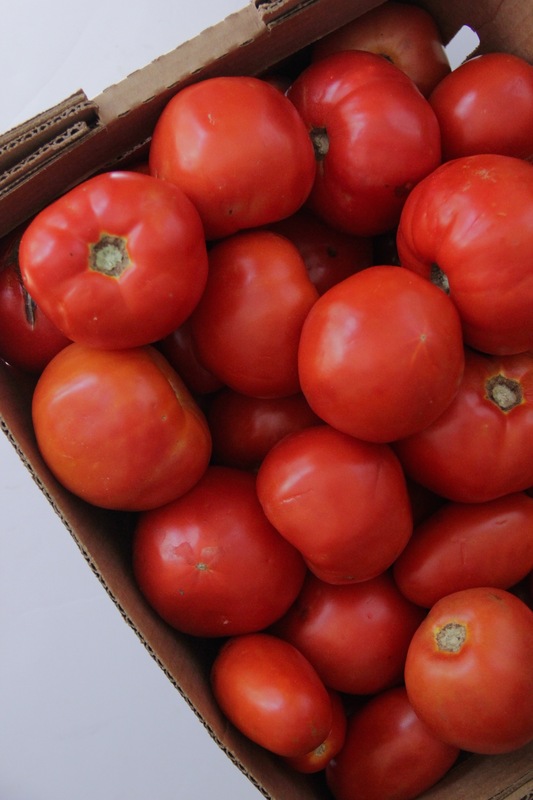 Prep the Tomatoes: Carefully place a small ‘X’ on the bottom of each tomato before adding it to the boiling water. Add 2-3 tomatoes at a time and blanch them for 30-60 seconds before removing and placing in the bowl with cold water and ice (you may need to add more ice as you go depending on how warm the water gets). This makes it easy for the skins to be peeled off! Peel the tomatoes and cut away the stem section and any possible bad spots before quartering each tomato. Start Canning: When you are ready, carefully remove the jars (this is where I use the jar lifter- if you don’t have that, use a thick towel or pot holder), pouring out any excess water. Increase the heat to start bringing the large pot to a boil. Begin stuffing the cut tomatoes into the the jars, leaving 1/2 inch of headspace between the tomatoes and the lid. Using the wide mouth funnel can help keep the rim clean! Really pack them in tight- you want as little air as possible in-between the tomatoes! Top off each jar with 1 teaspoon of lemon juice and 1/2 teaspoon of salt. Using a damp cloth, wipe the rim of the jar. With the magnetic lid lifter, remove the lids and bands. Place the lid on first (with the rubber side down) and firmly screw on the band. Once you have enough jars to fill the large pot, carefully place the jars in the boiling water. Submerge and cover for 40 minutes. When you remove the tomato jars from the boiling water bath, place them on a towel and allow them to cool. As they cool, the lids should pop down (it’s always and exciting thing to hear!) and should no longer flex when you push down. If after 24 hours, any jars don’t seal properly, store the tomatoes in the fridge and plan on using them up immediately (this is usually when I decide it’s time for tomato soup). Storage: I prefer to remove the outer bands before storing, as it allows any water that might be underneath to dissipate and prevents any rust. It also makes it very easy to tell if a jar becomes unsealed for any reason! 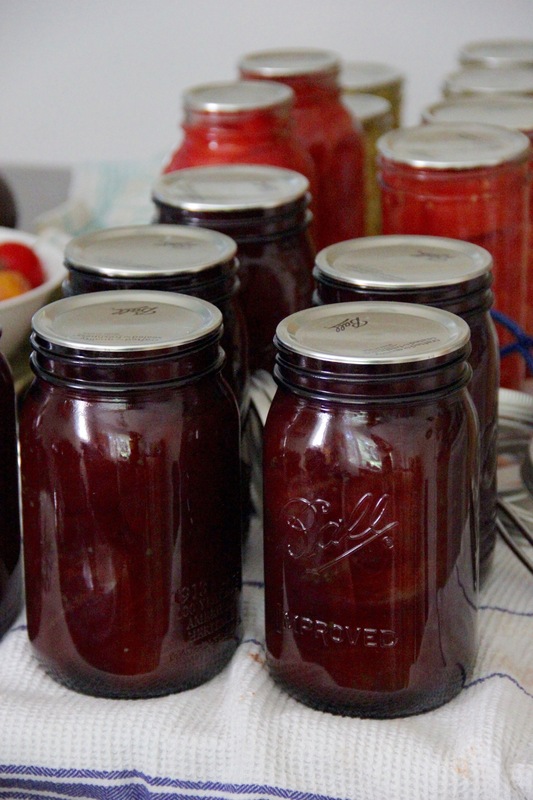 Store the canned tomatoes in a dark place, like a pantry or cupboard.